"A Day You'll Never Forget." Alamo Drafthouse has announced a very special, one-time-only event taking place in Montauk, New York, right on the beach. 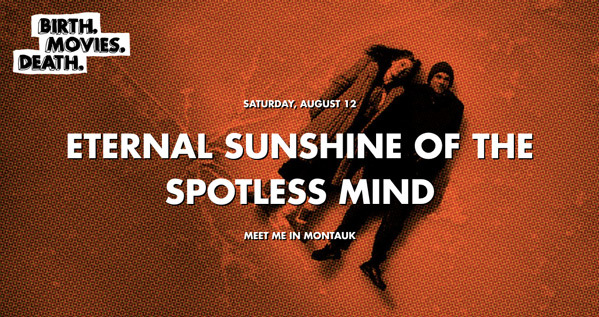 They're showing a special screening of Michel Gondry's Eternal Sunshine of the Spotless Mind, one of the most beloved romance films of the last 20 years. Alamo Drafthouse and Focus Features are teaming up as part of Maverick Cinema to present "Meet Me in Montauk", an event taking place on the beach, with mattresses for a "bed-in" experience, paying homage to one of the film's iconic scenes (seen above). It also includes an afternoon tour of filming locations before the screening, making it a truly unique experience and must-attend for those who are die-hard fans of this film. Tickets for the screening will go on sale starting next Friday, August 4th, and no price has been revealed yet. If you're interested, click below to find out more or follow @bmoviesd for updates. Seating for the event is super limited -- and once tickets are gone, they’re gone. I'm already excited to see the photos from this day. "For devoted fans like myself, I can't think of any better way to experience director Michel Gondry and screenwriter Charlie Kaufman's magnum opus on love, memory, and loss," said Drafthouse's Henri Mazza. Described as "more than just a screening", the special "Meet Me in Montauk" event includes an entire day of experiences. As explained by Alamo Drafthouse: "Guests will converge upon a secret location, then spend the afternoon on a tour of filming locations with stops along the way for photo ops and beach activities. The outing will culminate that evening in a trip to Gurney's Resort, where guests will watch the film under the stars and overlooking the beach while lounging on outrageously comfortable Casper mattresses. Plus, since it can get chilly at Montauk, Focus Features is providing all attendees with a replica of Clementine’s iconic (and cozy) orange hoodie." How's that for a perfect movie day? Let us know if you're planning to attend, as this really does seem like a once-in-a-lifetime movie experience, especially for true fans of Eternal Sunshine. As we await this movie, RodGames surprises with new actions and new games. The game hold position is just one of them.